News / Opinion / Is Fitzroy losing its built form character to apartment development? Walking through the back streets of Fitzroy not all that long ago with camera in tow, the visit provided an opportunity to observe the healthy number of apartment developments currently under construction. With most in the vicinity of Brunswick Street, a question sprung to mind; is Fitzroy losing its fine grain character due to the increasing number of apartment developments subsuming prime and/or historic sites? Naturally my perspective is slanted toward built form and street level character, whereas the average visitor to the area would not in all likelihood spend the majority of their time on Brunswick Street thinking along the same lines as me. That the Brunswick Street nightlife, entertainment and fashion strip has to date been spared from development is perhaps the critical point to consider. Very few apartment developments of any note have found themselves holding prime Brunswick Street frontage in recent times. 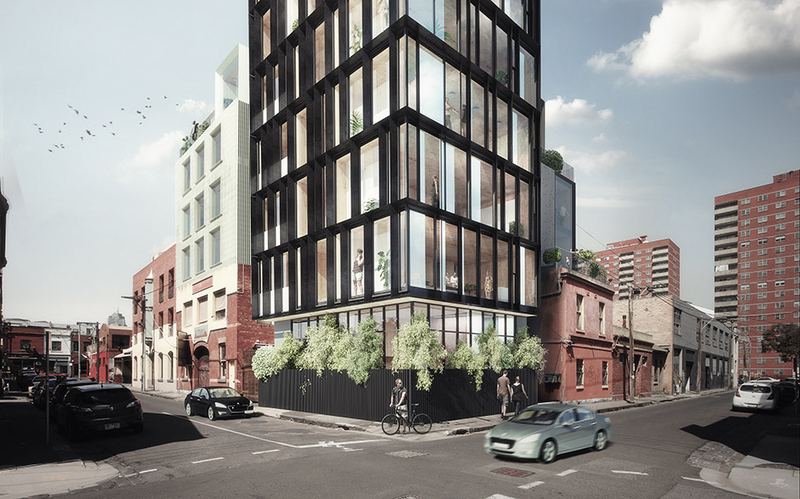 Urban Melbourne's project database shows the only current project as 422 Brunswick Street which is seeking approval. City of Yarra's Planning Register shows the proponents of 422 Brunswick Street as still striving for approval after two years in planning..make of that what you will. So interest moves to the back streets where the real action is happening. Do current Fitzroy apartment developments mimic those of other suburbs, or are they truly reflective of the unique surrounds? Clockwise above are Nojo, Bespoke, District, George Corner and Miya. What do that have in common aside from being under construction? They're all small to medium sized developments that have design character, which introduces a fresh dynamic to their surrounds. The key with Fitzroy is minimising impact; small is good! There are 21 current Fitzroy listings in our project database and all are demure in size but generally highly design competent. Development of this scale certainly doesn't detract from Fitzroy's existing urban character given they are well designed, small-scale developments essentially surrounded by masses of existing, dated buildings of a similar scale. There is one notable exception though. NKYA was complete over an entire Fitzroy block during 2011, with project architect Ivan Rijavec providing a spirited description of both building and surrounds on Urban Melbourne during 2013. While it has many varying facade elements to break its mass, NKYA for many represents the overdevelopment of Fitzroy. I appreciate the nuances of the design, but I'm not a fan of its scale and imposition upon surrounding streetscapes. 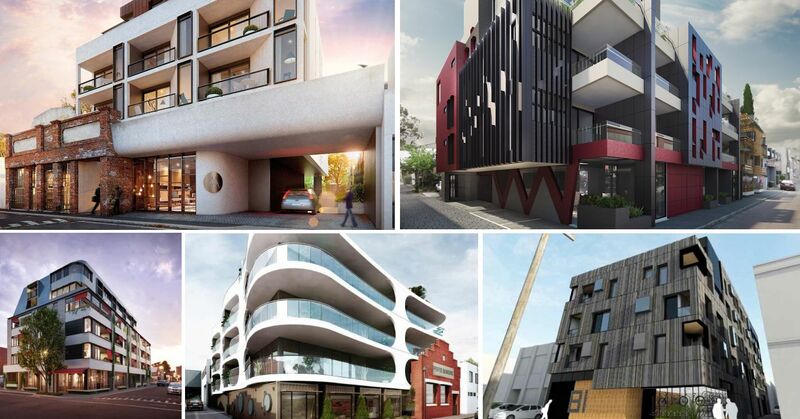 Looking ahead the Fitzroy development pipeline is also laden with residential projects that fit the bill, as seen above with five diversely designed projects highlighted. Yet for mine the best is Room 11's recent scheme for the corner of Spring Street and Argyle Street. While the below image depicts the original design, a current resubmitted planning application has just completed it's public advertising period with City of Yarra. Maintaining the eclectic nature of the area's built form is key to maintaining and dare I say enhancing the area's intrinsic character, otherwise Fitzroy would forever remain a museum showpiece. Room 11 have devised four visually distinct buildings in scale with their surrounds, plus the retention of historic facades to both frontages; this is solid design befitting the area! Celebrating the fine grain of Fitzroy with simple, abstracted forms, four distinct mini towers are proposed rather than a single monolithic “wedding cake”. The project seeks to amplify the fine grain nature of the site and surrounds and provide density which does not impact internal or surrounding amenity. The development sits between infill and landmark – a hybrid condition which is clearly defined via the breakup of the building into distinct blocks separated by ‘lane way’ voids. These voids increase the ability to provide a greater internal amenity and allow the continuation of the fine grain found throughout the area. Utilising existing buildings on site and the vacant corner, we celebrate the fine grain of Fitzroy with simple, abstracted forms, Four distinct mini towers, rather than a single monolithic “wedding cake”. When you tend to walk about a certain area for a long enough period, changes to an area's feel and composition become quite discernable. Does Fitzroy's existing built form and character suffer with the introduction of the new in recent years? I'd contend no it does not. In fact I'd assert Fitzroy in many ways leads all other areas of Melbourne in terms of progressive, appropriate apartment design. City of Yarra look to have done a solid job of overseeing the gradual implementation of many new a apartment project in Fitzroy, with retention of local character to the forefront. Small and varied, this 'mosquito squadron' of contemporary development is bringing a new dynamic to Fitzroy's back streets without compromising the abundant character that has been created over many decades. The answer to your headline is yes, though the built form that is being lost is the light industrial 2-3 storey areas being replaced by 4-6 storey apartment developments. Generally this is fine (except when like me youve got a crane out the back yard and trucks out the front at 6.30 in the morning). Its the ones that are larger area and taller, or on main streets, that are problematic - like the large 7 storey block at 67 johnston and the 7 storey proposal which facaded an 1850s hotel at 422 brunswick. and a 10 storey thing on johnston near smith street - if these are approved, and built, then we may get 'apartment creep' with even taller things proposed, especially on main streets, which would indeed change and dominate the character of parts of fitzroy. Unfortunately there's no strong controls in place to ensure development is appropriately scaled..